Stopped in my LCS today, and picked up ten of these. They're pretty sharp. 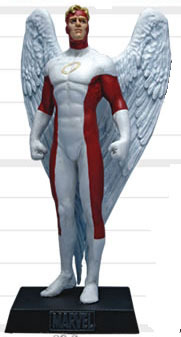 I had to immediately repaint the Angel of course, restoring him to his proper black and white (even tho it was the red and white version I drew in THE CHAMPIONS). Which ten? Have they released a Thor figure? They have indeed released Thor. 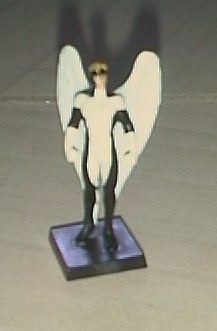 Go to www.marvel-figurines.co.uk to see the full line-up. By the way, JB, when you repainted the Angel, did you restore his shoulders to the original design, or did you keep the peaks? Unfortunately, the little figures have scribed lines demarking the edges of colors on the costumes. These are somewhat erratic, some quite deep, some barely visible. In the case of Angel, the scribed lines on his shoulders are quite deep, and would be, if anything, high-lighted if I changed the configuration of the colors. On his mask and legs, however, this is somewhat less of a problem. As usual, sorry for the blurry shot. I really don't get enough use out of my digital camera to justify the expense of a better one! My LCS has a bunch; I just picked up Captain America about ten days ago. I just wish that they hadn't sculpted him with the shield facing behind him. Otherwise, nice fig. I only found two at our LCS, Black Panther and Loki . They were $12. Is that what they are running in the rest of the US? I think I paid about $10 each for mine. those are frieakin awesome. im ordering like 20 today. Evening gentlemen, glad to find another group of individuals with a liking for these figurines. Just to put you all in the picture I have a website concentrating mainly on this collection. I have a regular supply of scoop news and images direct from the editor of the magazines. Personally I think the figures are awesome and the collecting community appears to be ever expanding. Confirmed run up to 80 figs, 99% certain will go up to 100 and there is a very strong possibility of going way beyond that. I won't post any spoilers here (that's not my style) however if you do want to see more, and I mean MUCH more nip into my website and have a browse around my collection and other stuff. I'm not here to poach members or anything, just want to spread the word. I run a forum too, if you are interested you will find the links. We do our best, Steve. Welcome. I was kind of hoping DC would get something similar produced. Also glad that the Marvel collection is getting bigger as some good characters are missing from the lists I have seen. David, what list have you seen? The one on WIKI has been wrong for ages. Everytime I correct it someone changes it back :( seems to be OK for now tho. We have the names of figs up to 80 (confirmed by EM) plus a few others of those in the 81-100 range. Can't remember but up to about 60 I think. Must look at your list. Something wrong on WIKI?? I refuse to believe it. LOL, it has been confirmed on WIKI that the earth is flat, apparently a geological survey was carried out by Elvis and a Yeti in a spaceship flown by ET. My collection has grown to 12 figures now, so my big question is -- do any of you know of a source for these things from which I can just order up all the ones I want and not have to seach eBay or other nefarious sources? Diamond Comics in the U.S. has taken up an interesting means of offering the series. Pairing the two newest with two of the originals every month. You can pre-order them via your local Comic Book Shop every month. Each figurine and magazine pair is $12 each, though many stores offer a discount if you're a member. I pay $10 each for mine. The Specials like Hulk, Juggernaut, and Colossus retail for $20 each. Black Costume rooftop Spider-Man is $29. They also offered the Binders for $12 and the Plinths for $22. No word on Galactus. By the way, I have contacted Eaglemoss and it's been confirmed that the United States will not be recieving either the 'Blue Angel' or 'Dark Phoenix' variants via Diamond Comics due to exclusive distribution rights with Forbidden Planet International. If you want either of those variants, I would suggest that you get in touch with someone from the UK who can help you. Also, it's unlikely that the U.S. will get the original Rooftop Spider-Man due to dwindling supplies in the UK. So keep that in mind also. Cheers. This is a direct quote from one of the US based collectors (BEAST) on the MARVEL forum. We have several US collectors and any one of them will gladly help your source the figures. Ok stop talking about these. I've been looking on ebay for like the last hour for them. BTW - The She-Hulk is sweet. I've had trouble getting the Black Costume Spider-man. got my first one yesterday off ebay. it's great but i am a little freaked at they're made of lead. is lead like a really good materail, except for the death part? Can you see the one that doesn't belong? www.midtowncomics.com has about a dozen in stock. Just do a search for "Marvel figurine". I just got mine today at a small comic shop. I managed to pick up some pretty cool ones: Thing, Magneto, Spider-man and Wolverine. They were $11.99 and the store knocked off 10% since I was buying four. After opening them up, I'm hooked, I'll have to swing by later on this week and pick up the Green Goblin and the Angel. They are unbelievably detailed and look awesome!! For some strange reason I really like the fact they are metal and not plastic. Thor, Daredevil, Electra and the Vison are the next on my wish list.